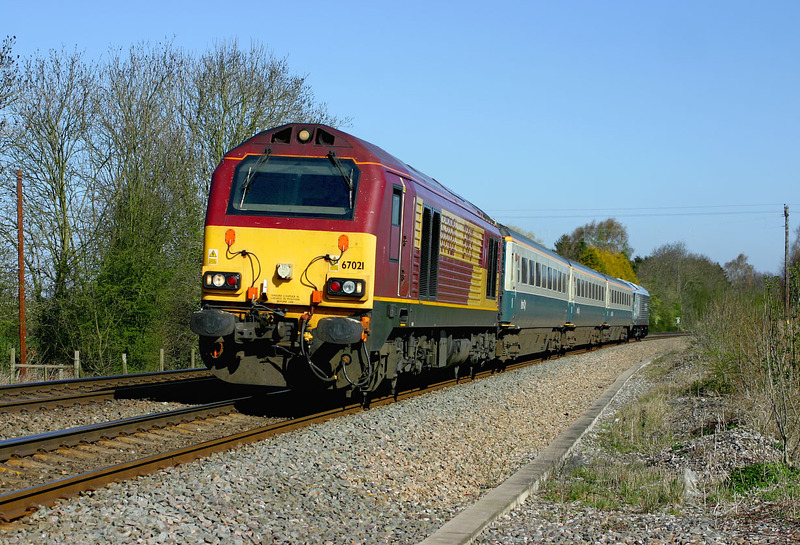 67021 passes Claydon at high speed with a crew training run for Wrexham & Shropshire Railways on 15 April 2008.This was running in the path of what will be the 1P03 07:25 Wrexham to Marylebone service when passenger trains commence running at the end of April. 67012 in W & S livery can be seen on the rear of the train. On this occasion the train was running 20 minutes early. I suppose there is a certain novelty value in having a train made up of an EWS liveried loco, 3 blue & grey Mk. 3 coaches, and a grey liveried 67 on the rear!